and will curl up on the couch with a movie soon. My son & I are still in our pajamas @ 1:30 in the afternoon! It doesn't get any better than this. I love a good snow day. There is nothing like being cozy & warm in my home while nature does its thing. 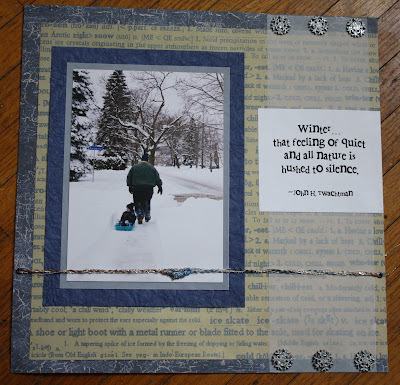 Everytime we have a snow day, I am reminded of this old scrapbook layout from 2003. One of my favorite snow pictures of my husband & son in the quiet of winter. Yes, I was once an avid scrapbooker. Not so much anymore though. Whether you are experiencing a snow day, just a little snow or even if it's bright & sunny day where you are, I hope it's a good one! I used to scrapbook too and then I discovered blogging! I keep meaning to get back to it. That's a very nice page. third day in, thank GOD I have BUNCO tonight, it is starting to thaw. I hope you had a fun day! We don't get many snow days here in Florida LOL! Pajamas alllll day sounds like a dream! Just checking out your bog, Gina. I like it. It is February 5 in Mississippi and very cold here. I am still in my gown at 10 and watching an old movie with Joanne Woodward and Marlon Brandon filmed in 1960. Talk about talent, this is talent. Hummmmmmmmmmmm! They just do not make them like this anymore. I see I misspelled "blog". Oh, well!